Off The Cuff DC is right on target with a very elegant addition to your holiday wardrobe. Think Gianni Agnelli and thank OTC! When the Elegantologist contacted me regarding this holiday project, what single item, I mused, would be appropriate for such an illustrious list? While such pedestrian items like a new back scrubber or shoe shine kit make excellent and, hopefully, well-used gifts, they do lack a certain élan. Functional and cherished do not always go hand-in-hand. I also let my mind wander to the other extreme. Were money no object, who would not appreciate a pair of hand crafted John Lobb balmorals or the singular experience of slipping into Jay Kos’s stunning cashmere blazer, tailored – just so – to fit your frame? Someday perhaps, but the holidays are upon us; what about right now? To my mind, a Drakes of London 100% cashmere tie is that gift. Handmade from start to finish, Drakes ties are indeed made in London by real craftsmen. Not too wide and not too narrow, the form and quality of a Drakes tie will handsomely carry you through one trend after another. 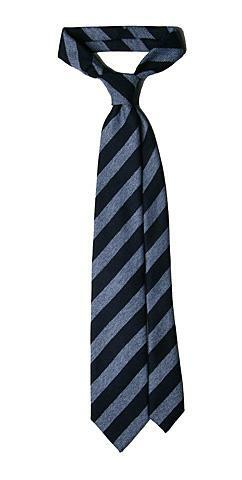 The sky and navy block stripe tie (seen above) is a particularly elegant combination. This entry was posted in 2008 Holiday Gift Guide and tagged Drake's of London, gift guide, Off the Cuff DC. Bookmark the permalink.